Well, since I have joined the BB Frösch team, I have been trying all sorts of things I never thought I would do. I set out to good ol’ Michaels to see if they had any glass bottles I could turn into something amazing, and as luck would have it, they did! And the best part, each one was a $1.29 or under—score! But my luck didn’t run out there. 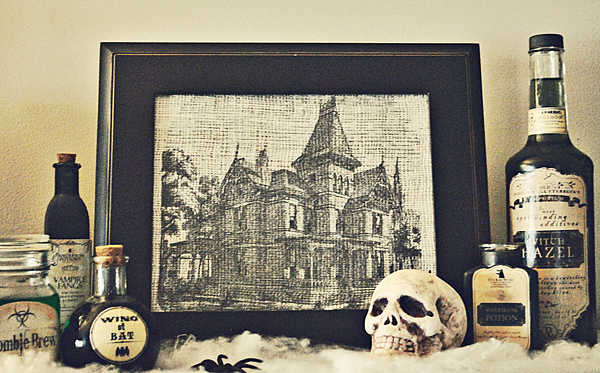 Most of their Halloween stuff was 50-60% off, so therefore I made my whole display with what I purchased at Michaels, plus a couple small things I already have for….drumroll….$25! Double score! I wanted some of the bottles I made to be black, and thought I would put the “BB Frösch bonds to virtually anything” claim test. I started out with my plain glass bottles and put a quick few coats of BB Frösch chalk paint with some leftover black paint I had from another project. 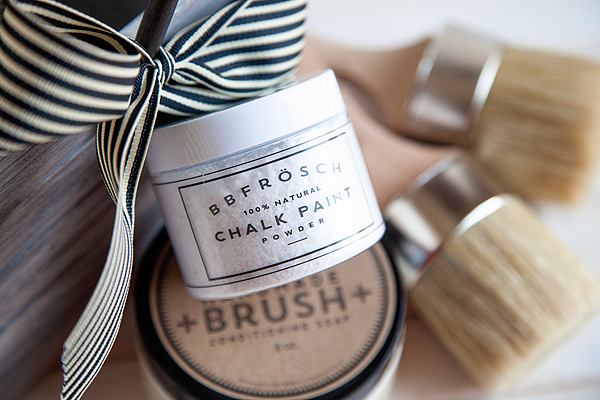 BB Frösch isn’t just for furniture! And when I say quick, I mean quick. Three coats on those four bottles took me about 25 minutes, drying time included. 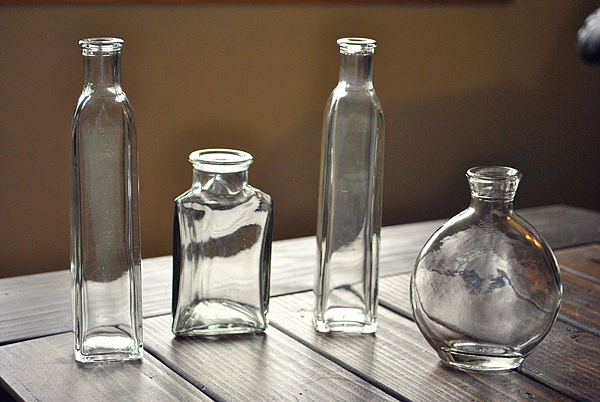 I then took a wet rag to wet distressed the tops and corners of the bottles to create a more authentic vintage look. I chose to leave the other bottles clear, so I could put some water with food coloring inside. 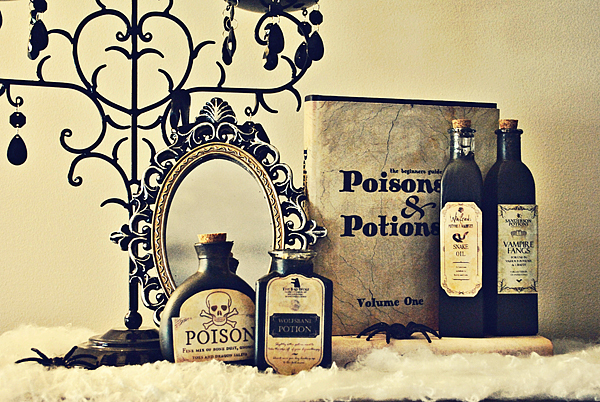 Then, because I am cheap 🙂 I searched for free vintage apothecary labels online and found some awesome options! I printed them off on regular paper and Modge Podged them under and on top of the label. 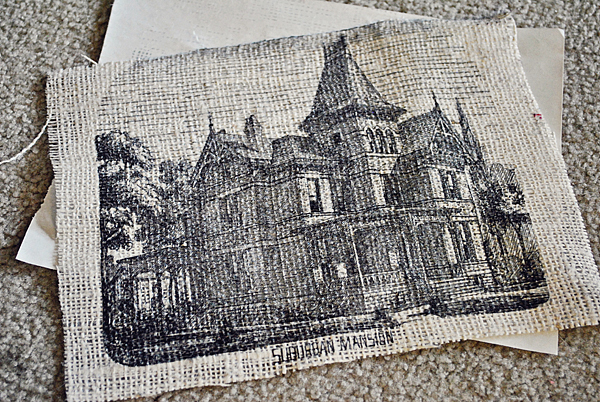 Then to complete my display, I printed a beautiful, but slightly creepy picture of an old Victorian house (that was most likely haunted) on burlap. Yes, you read that right, I printed on burlap, as in on my home inkjet computer. Amazing! You can find this easy to follow tutorial on Domestically Speaking. It seriously took me about 10 minutes. 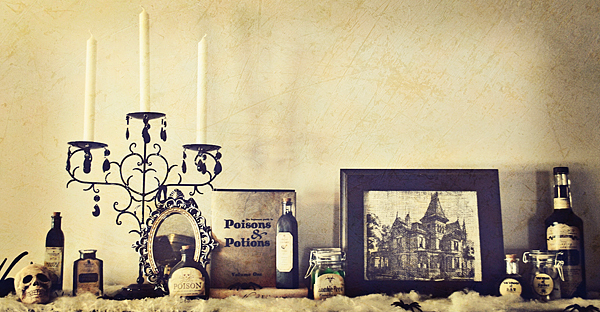 The graphic I used as well as several other vintage halloween images can be found on The Graphic’s Fairy. There, I did something I never thought I could do, and quickly and inexpensively! Happy Halloween!